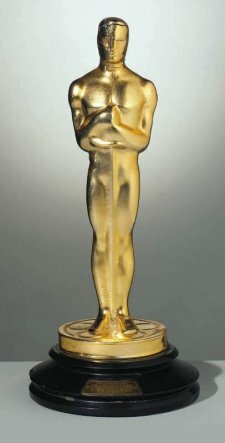 This 1935 Best Actress Oscar, the first of two won by Bette Davis over the course of her career, was earned by Davis for her performance as a jinxed actress in DANGEROUS (1935). It was purchased at auction on December 18, 2002 for $207,500 by director-producer Steven Spielberg who donated it to the Academy of Motion Picture Arts and Sciences. 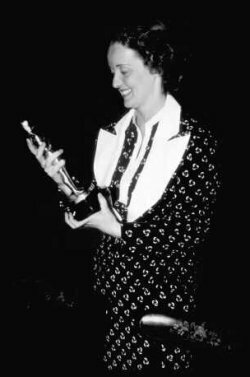 Bette Davis receiving her Oscar at the 8th annual Academy Awards ceremony on March 5, 1936 at the Biltmore Hotel in Los Angeles, California. Visit the Bette Davis section. Return to the Scrapbook main page.